Modern jump starters are multifunctional devices that are super useful. There are hundreds of models available today, but I use Brightech SCORPION. It has great design, it is portable and extra reliable, I know that the device will always help me start my car, no matter what. Its design is quite cool and aggressive. I have the crimson-red version. It has a shape that looks like a scorpion. The sharp lines make the device look modern. It is light and portable, so I can carry it with me without any troubles. This device has a flashlight, so I can use it when it gets dark. Another important factor is that this device has two USB ports and I can connect two devices to charge their batteries. Therefore, it is not the device that just lays somewhere and you use it only when an engine does not start. I use it often to charge my smartphone. Despite its small size it is powerful enough and it does not require frequent recharging. It combines high performance with nice design and that is right what I like. Another important factor to mention is that it has our special award The best lithium ion jump starter and it won in the category Best for money. Therefore, it is not just a great device with many functions but you also do not need to spend too much to get it. This device is quite simple and it does not feature a LCD display, but it has LED lights that shows the charge level and it is enough. This is the device that I would like to every driver. It is light, easy to use, reasonably-priced and multifunctional, what else do you need? This is a lightweight device with a very attractive design, but its performance is crucial. 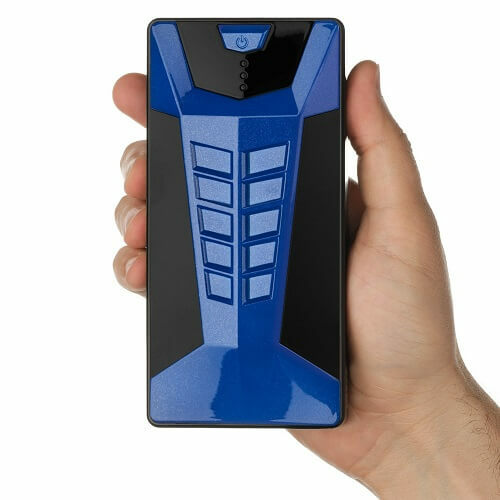 It has many functions and it can be used not only as a jump starter but also as a power bank to charge batteries of devices that use USB interface. The device also has a flashlight, so you can use it when it gets dark. The amp peak is 400. This power is enough to start up an up to 3.0 L gas engine or an up to 2.5 L diesel engine. The device can even start a V6 engine. A compact 44 Wh battery. Its capacity is enough to start up an engine multiple times without recharging. Five blue LED lights shows the charge level. The high-quality clamps are made of durable metal. A bright flashlight lets using it in dark areas. A 19 V 3.5 A output. The device is provided with different kinds of cables and connectors. You can connect almost any kind of devices to the starter. Available in four colors: red, green, blue and black. The weight is 2.4 pounds. The dimensions are 6.2 x 3 x 1 in. It is not powerful enough to start big engines or heavy-duty trucks. The plastic case may be damaged easily. The clamp cords are not long. This is a very good device that jump starts engines. Of course, it is not able to start up a heavy-duty truck or a big engine, but it is still very good. 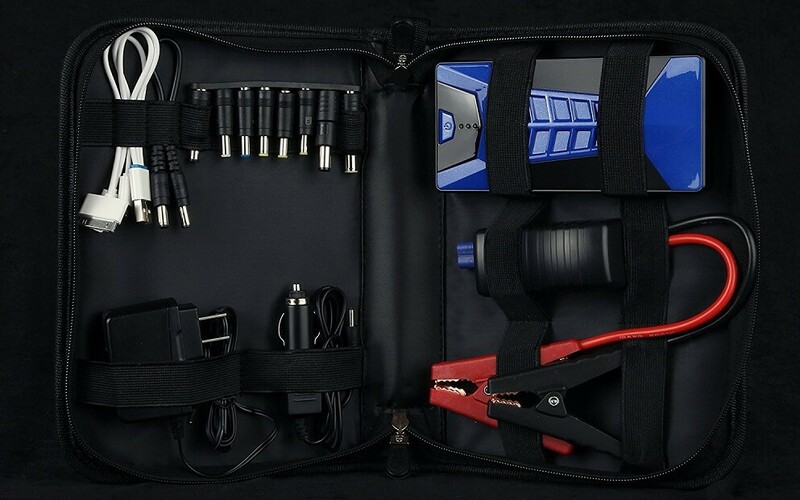 The device is provided with a very good case, where you can keep all the cables and other elements. The device is very ergonomic. It is light and quite small, so you can easily hold it with one hand only. It does not take much space. Another important advantage of the device is that it can be used to charge USB devices. This is a great multifunctional device that can start up an engine of your car. It is reliable and it looks very attractive. The device is provided with different cables and connectors, so you do not need to buy anything else. You will get everything you need to start an engine of your car or charge up your devices. Cars are getting older and so do their components. Buying a new battery may not be an option for you. That is why, you need to have a powerful jump starter and Brightech SCORPION is one of them. It is a multifunctional device that is very useful. It can jump start an engine or you can use it to charge different devices, like tablets or smartphones, etc. Another important advantage of this device is its price. Brightech SCORPION has our special award “The best lithium ion jump starter”. It won the category “Best for money”. Spending a reasonable amount of money, you will get a perfect device. It is very light and you can hold it in one hand. Of course, some people may mention that its case is quite fragile and it does not feature an LCD display, but on the other hand, it helped decrease the price. 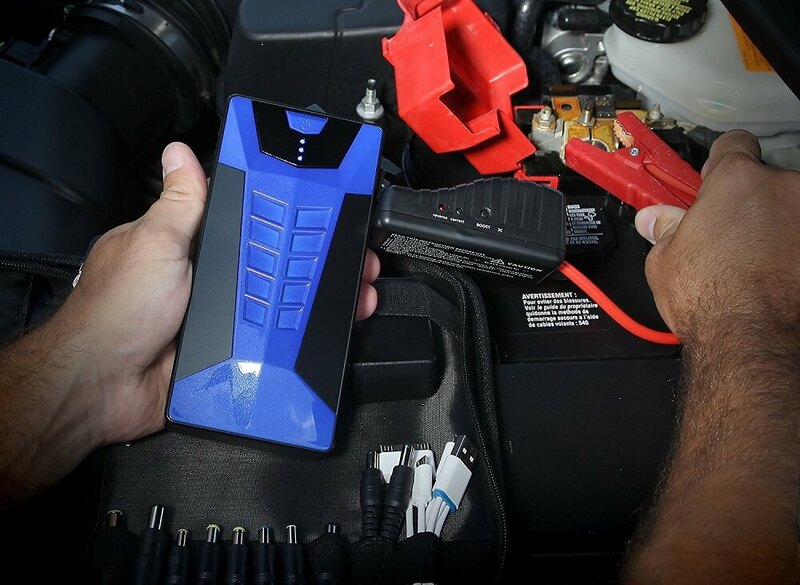 Overall, it is a very good device that does what a jump starter must do – starts your car. It does not take much space, but it is very helpful. If you travel a lot, or your car is quite old, or your battery is, then you should get this device, it will help you. In any case, you can use it to charge your devices.